Two Manitoba couples who have been married for decades are calling on government to keep them together despite health needs forcing them apart. Two Manitoba couples who have been married for decades are calling on government to help keep them together despite health needs forcing them apart. After 71 years of marriage, Dorothy and Allan Smith have only spent two weeks without each other. That changed in May when Dorothy, 92, was admitted to hospital, then to a long-term care facility in Brandon, after a fall. "I don't like it a bit. Don't like it at all. Because we've been together for forever and when one's not there, something's missing," said her husband Allan Smith, 95. Every day, he drives from the apartment they used to share at Riverheights Terrace to Fairview Personal Care Home, where his wife gets 24-hour care. Dorothy can't speak much anymore, but she beams when he arrives, and they sit in silence, holding hands. But the daily drive and separation are taking a toll on his emotional health, and he'd prefer a bed of his own in her building. "They won't let me, I'm not sick enough to go over there. I'm too well; I'm too healthy," he said. "I miss her not being here. I don't know that it has to be that way. If someone can explain to me why it has to be that way things might be better. But no one can explain to me why we have to be split. And I don't think anybody likes it." Allan has been his wife's voice since her stroke nearly ten years ago, and he's always taken care of her. Without her, he sits alone in his apartment until meals, which are held in a common area at his residence. She waits in her wheelchair at her facility until he arrives. "Life is not the same. Not by a long shot," he said. "We're not the only couple that this has happened to. And it's not a good thing. For anybody. Nobody wants to be split up." Ruth Wyatt, 85, and her husband of 68 years, Claire, recently chose to forego her placement in long term care, even though that would best suit her health needs, in order to stay at home together. "I don't know what I'd do without her. You get used to each other, you know. You just belong together. You don't like to separate at all," said Claire Wyatt, 85. Ruth is bedridden and doesn't leave a hospital bed set up in their living room. On Friday, they left Concordia Hospital, where Ruth had been for several weeks, after a fall. 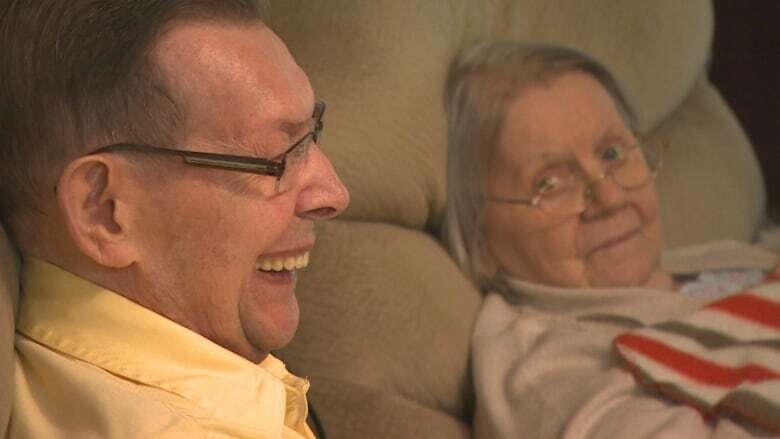 They were offered space in a personal care home that would accommodate them both, but they said it wasn't up to their standards and didn't feel like home, so they returned to their apartment in Transcona. They separated briefly last year when Ruth lived at Park Manor Personal Care Home while Claire waited for a space to open up at its attached elderly housing. "I couldn't eat. I was nervous. And I couldn't sleep. So I made up my mind in about a week that I gotta stop this and get her back here," said Claire. He packed her up and brought her home. "She loved it," he said, laughing. "She wanted to go home again." About 2.6 million people in Canada — seven per cent of the population — are currently older than 75. That number is predicted to more than double over the next two decades. Many of those seniors are married, and will face similar scenarios as the Smiths and Wyatts. The Smiths' daughter has launched a petition — which has already garnered more than 25,000 signatures —campaigning Minister Friesen to change the criteria in Manitoba for personal care home placement to accommodate couples with differing levels of care who don't want to be separated. "It's very difficult when your care-givers, when your parents who have been your care-givers for as many years as they have, to see them struggle and suffer and be in as much pain as they are, and for me to realize this is a guideline that's keeping them apart," said Barbara Smith, 67, through tears. Although Manitoba's health minister says he sympathizes with her parents' situation, there's no move to change Manitoba's model of care-delivery. "Expanding the criteria to allow people who don't meet the criteria for placement in these homes alongside their spouses would, in turn, reduce the number of beds for those Manitobans who do meet the necessary requirements, have been medically assessed and are awaiting placement," said Cameron Friesen, in a statement. "Let's change the guideline to reflect a more humane resolution and a more humane solution to this kind of situation," countered Smith. A spokesperson for Prairie Mountain Health said discussions are continuing with the family. Guidelines in BC, where Smith lives, are different, she said; couples of varying levels of care can stay together if the independent spouse takes care of their own meals and doesn't use the home-care services. The Manitoba criteria is causing her dad to waste away from heartbreak, she said. "He has lost a lot of weight. He's not eating properly, he's not as social, he doesn't leave his suite. He goes down and has his meals and then comes back. He cries on the phone to me because he misses Mom. His health isn't good, he's very, very tired, emotionally drained. And yet he feels responsibility to visit my mother every day. Even though it's hard on him, it's taking its toll, it's obvious." Claire and Ruth Wyatt's daughter is equally concerned for her parents; even though home-care visits four times a day, she knows her mother would be safest in a nursing home. "They're together and I know how happy they are but I'm afraid every minute of every day for their health because they're vulnerable," said Denise Petrycky, 61. Prior to her mother's admission to hospital, she and her father had called an ambulance six or seven times to help her up after falls, which is Petrycky's biggest fear now. She said she visits her parents every day, cooks for them and is grateful for the home-care staff, but still worries. "Mom falling and breaking a bone or a hip. And they both have dementia. Mom's at a very serious stage and dad has no short-term memory, he has hallucinations. To know that they're here alone is very scary." 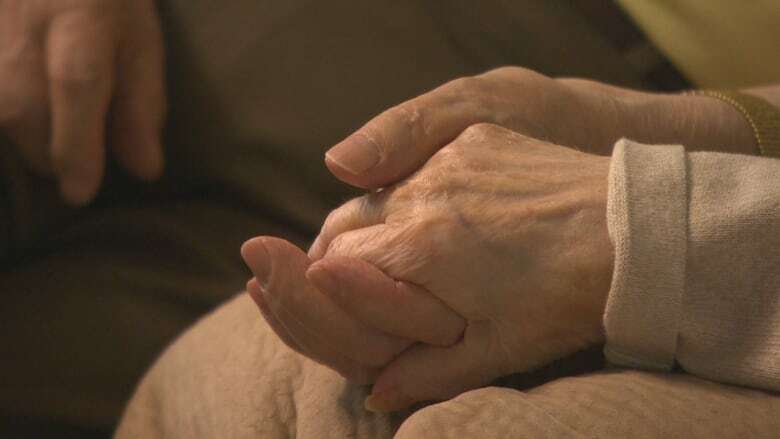 According to the Winnipeg Regional Health Authority, keeping couples together is a priority when it comes to long-term care. According to a WRHA spokesperson, when both spouses require placement in a personal care home, case coordinators work with them to find the options that would let them stay together. "The challenge is that often both spouses do not require placement at the same time, with one spouse often requiring placement prior to the other. In these situations we will work with the family and clients to outline options to reunite the spouses as soon as possible," said Amy McGuinness, spokesperson for the WRHA. Those options can include care homes with attached or adjacent housing for seniors, of which there are eleven in Winnipeg. The authority says the number of couples seeking reunification is 'generally quite small,' and they're working with the Wyatts to best suit their needs. But with a singular care home option that didn't suit her parents' needs and an indeterminate wait until one opens that does, Petrycky wants more done. "Somebody has to come up with a new plan for elderly people who are still married. You can't just separate them. They won't make it. My whole life, my dad made everything that had to have happen, happen. He always found a way, and now it's my turn to find a way for them," she said, through tears. "My father laid his life on the line for this country during the war," said Barbara Smith. "I'm sure he didn't expect at the end of his life, in the twilight, would he be torn apart from my mother." Barbara Smith said she knows of several other couples in her parents' situation at Riverheights alone. "They deserve to be together and yet the Manitoba health guidelines treat every situation as an individual person rather than a unit. My mom and dad or any elderly couple in this situation should be treated as a family. They can't just separate them as they are right now, living in an involuntary separation." After Allan Smith leaves Fairview for the evening, his wife eats dinner there; he eats at River Heights. "It's not the same as if she were here all the time. You get used to each other, after awhile," he said. 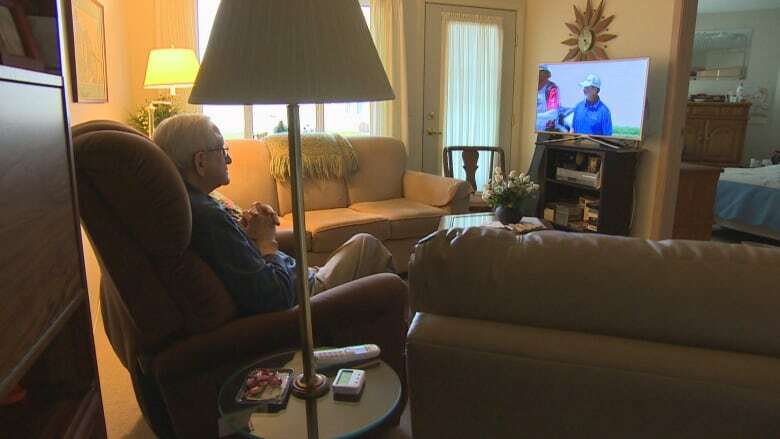 "After dinner I come home, read the mail if I get any, I don't get much of that, and sit here, and watch that thing," he said, pointing to his TV. "All the time I miss her. Yeah, I wish she were here all the time. It's no fun crawling into that bed all by yourself." The Wyatts are happiest together, just holding hands. Claire and Ruth will hold onto life together for as long as they can to avoid that heartache. They're back on the wait-list for spots at Park Manor. "I love her. Very, very much," said Claire, through tears. "It disturbs me, she's not long for this world; neither am I. But we want to make a pleasure of having us yet. We enjoy each other." "I don't like him to be away from me for very long. I miss him if he's gone," agreed Ruth.